Mark Rohan outside The Bike Shed, Quinta do Lago, Portugal. 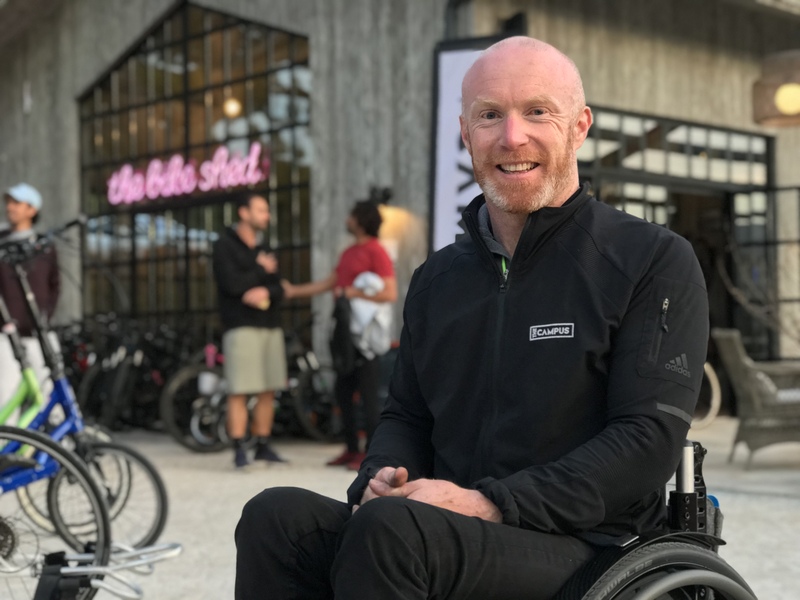 Gold medal winning Paralympian Mark Rohan on sunny climes, the crash that crushed his spine and the cycling potential of the Algarve. 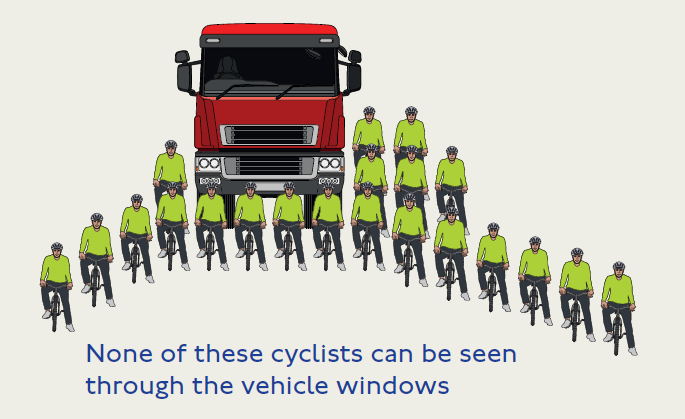 The driver of this HGV can’t see any of these 21 cyclists? Really, really? Truck driver Clive Matthews contends there’s no such thing as a blind spot on trucks. He sat me in his cab and walked around his truck (with my bicycle) as I watched him in his many mirrors. Full story on Forbes.com. Cycling and walking commissioner Will Norman leads Mayor Sadiq Khan at today’s launch of the Cycling Action Plan at Edmonton Green where work has recently finished to make a roundabout safer. Behind Khan is Cllr Nesil Caliskan, Leader of Enfield Council. Mayor of London Sadiq Khan has today joined London’s cycling and walking commissioner Will Norman at a new-build protected cycleway in the Outer London borough of Enfield for the launch of the capital’s Cycling Action Plan. 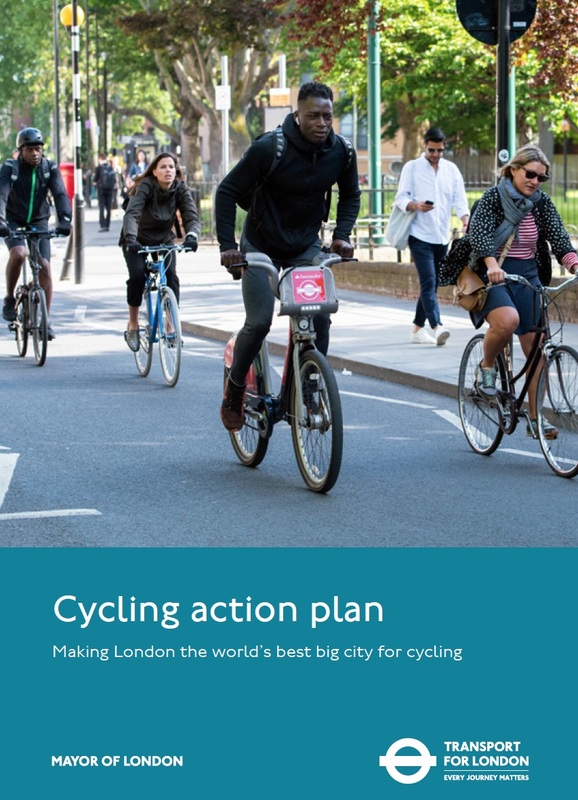 This five-year plan sets out the timescale for tripling the number of protected cycleways since Khan came to office and also reveals new quality standards for cycling infrastructure. Last week, for a news story on Forbes.com published today, I recorded an interview with Will Norman previewing today’s launch. Full transcript of Will’s words can be found below. We have a climate-change emergency, a toxic air crisis, an inactivity crisis in London, and with a significant growth [in population] that’s coming in is only going to exacerbate these challenges – so, the Mayor’s transport strategy set out the way we need to make changes to the way we move around our city to cleaner, greener, more efficient modes of transport. And cycling is a critical part of it. The Cycle Action Plan follows on from the transport strategy and is integrated with the Vision Zero plan, and the walking plan, and it outlines the really significant investment in cycling. TfL’s business plan, which was published last week, sets out the £2.3-billion investment in the Healthy Streets portfolio over the next five years, and given the financial constraints that exist at the moment that really shows how much the Mayor is prioritising healthy, active travel. The plan itself is how we’re going to deliver a unified cycle network across London. We were left with a bit of a mess in terms of branding. It confuses people. We’ve done market research, and it confuses people who are new to cycling or thinking about cycling. “What’s a Cycle Superhighway? What’s a Quietway? What’s a Mini-Holland? What’s a London Grid?” We need a network of cycleways that are good, are high quality. One of the criticisms we have taken on board is that standards haven’t always been up to the quality we would want. We’ve already started changing that, and I wrote to all the boroughs earlier this year. We’re saying “no” to schemes that aren’t good enough quality. The [criteria] include the volume of traffic, the speed of traffic, the width of roads, including the amount of space for cyclists and turning vehicles, the number of heavy goods vehicles and kerbside activity. What we want is if those are exceeded in any way we’re looking at segregated cycling on there. In addition, the plan sets out our delivery for new routes and how we’re going to deliver this network. As well as delivering this network, particularly for new people cycling, for those people who are considering cycling – which for me that’s the critical audience. We need to make our routes safer for people already cycling, and making London’s streets better for cyclists but we also need to attract new cyclists, people who are thinking about it. Maybe those people have a bike in the shed that doesn’t get out very often, or a bike on a balcony – how do we get them off the balcony on to the street. What scares me the most is the amount of inactive kids. About 80% of London’s kids – like most cities around the world – are inactive. We have designed activity out of everyday life. So we have got a particular focus on more engagement with schools, increasing the amount of cycle training. I want that to be aligned with the infrastructure – we can built it and they will come. All our evidence shows that – where we invest, people come and cycle. Numbers increase where the investment goes in. But not everybody comes so we need to do more proactive stuff in terms of engaging communities, making sure that the cycling on our streets reflects the diversity of London’s population. Getting the next generation to fall in love with cycling is essential. We’ve got a pipeline of routes and infrastructure we’re building [and] we need a pipeline of future cyclists, people loving it, people having fun and being out there. There are two types of critics – one, people who are opposed to cycling and any intervention. You only have to go on Twitter to see the people complaining that more cycle lanes will increase congestion. Actually, that’s totally wrong – all the evidence shows that putting in cycle lanes, enabling more people to cycle in London, making it safer for people cycling alleviates congestion. There was an independent report published last year that showed that congestion in London is from road works, it’s from development, it’s from broken down vehicles, it’s too many cars. We need more cycle network, more safer cycling in London. I refute this idea that more cycle lanes create congestion. They are absolutely critical to the future of the city, and making it easier for getting around. That issue around congestion is different characteristics in different parts of London. In central London, the mode shift [away from] cars is essential. The fact there are a quarter of a million car journeys every morning associated with the school run is still my shocking statistic of the week because so many of those are local journeys. How do we get them to be more walking and more cycling? The infrastructure [and] working with schools, making it safer, is part of that. The other side of criticism is from those people who have said we’re going too slowly, is that just another plan, why aren’t you getting on with it? It’s the opposite end of the spectrum of criticism. And I say to them, we are building, we are going at pace. 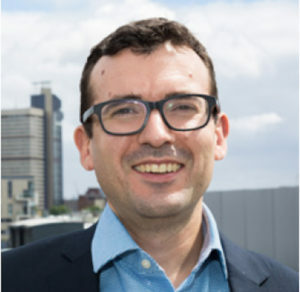 The Mayor made a commitment to triple the amount of protected space for cycling in London that was part of his manifesto in this election campaign – 50 kilometers of protected space were built by May 2016. We are delivering, this stuff is happening. We’re already nearly doubled it, we will triple it by the end of this term, but this plan sets out how we’re going to do that, the phasing and the delivery of the future routes. Sadiq has been criticised that he has not been prioritising cycling – the fact we’ve got this investment, we’ve got this plan, we’ve got this evidence-led approach is absolutely critical. I suppose the other piece connected with the delivery, that is said to have slowed down, well, we want a network of cycle routes across London for all Londoners. And just delivering on the 5% of roads that are controlled by TfL and the Met [police] will never ever create that pan-London network that is so important. So that is why working with the boroughs in a collaborative way is absolutely critical. And you see, where boroughs share the same ambition we see results. This is not just a plan for City Hall and TfL Delivering it is going to require the hard work and creativity of the boroughs, the community, businesses, and everyone in London who’s passionate about improving the city. Sitting alongside the cycling plan there’s a plan for increasing communications and how we’re communicating. There are three levels to that – one is continuing to make the case for why cycling is so important. Secondly, it’s engaging those people who maybe are not cycling at the moment, and are thinking about it. And it’s not just in terms of press releases but using social-media influencers on Instagram. There are two strands – communications from TfL and from City Hall, but also widening it out to advocates, and not just cycle advocates. We recently published a piece of work about the economic benefits of cycling which really shows the benefits this brings in terms of thriving economics, both for small and big business. Using that data to champion this in areas where the messaging hasn’t got through historically. As we go forward the terms Cycle Superhighway and Quietway will not be used in the future. I want this to be a forward-looking plan. No-one will appreciate redoing everything, but we need to move forward, we need to push on with the delivery – the retrofit will be over time, but that isn’t going to be a focus. Some of the feedback we had was that not all the Quietways are quiet and not all the Cycle Superhighways are super. So how do we make a network that has a quality standard across it, so people can anticipate what they’ll be cycling on, and where? London is still leading, we’re investing more, we’re delivering more. I’m delighted for Manchester. My sister lives in Manchester. The cycling there is the better it is for everybody. What’s really exciting … London has been at the forefront of this and catalysed the change in cycling in urban areas in the UK. And now we’re seeing other cities taking this on board so Chris’ role in Manchester [is great]; there’s also good stuff now happening in Leicester, Bristol and other cities are taking an interest in this. The critical thing is funding – cycling still sits on the margins within the Department for Transport. It shows in the amount of money that goes into our road network, car infrastructure if you like. We need for funding to build the kind of networks we’re building in London. That’s why we have to continue to do that. One of the most exciting things about this job is that London is a catalyst. People look towards London not just in the UK but also globally – that’s why it’s important we keep pushing the barriers. The work we’ve been doing around the direct-vision standard – it’s London that has been leading on lorry safety, now the European Commission are looking to roll that out across Europe. That will change the way that trucks are designed across the whole European supply chain. Everybody will benefit from that, not just Londoners, not just people in the UK, but across the whole continent. 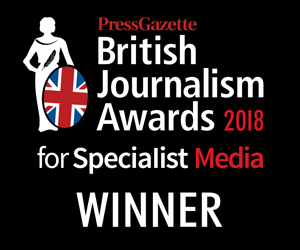 That’s why we’re continuing to push the boundaries, with funding, with innovation …. 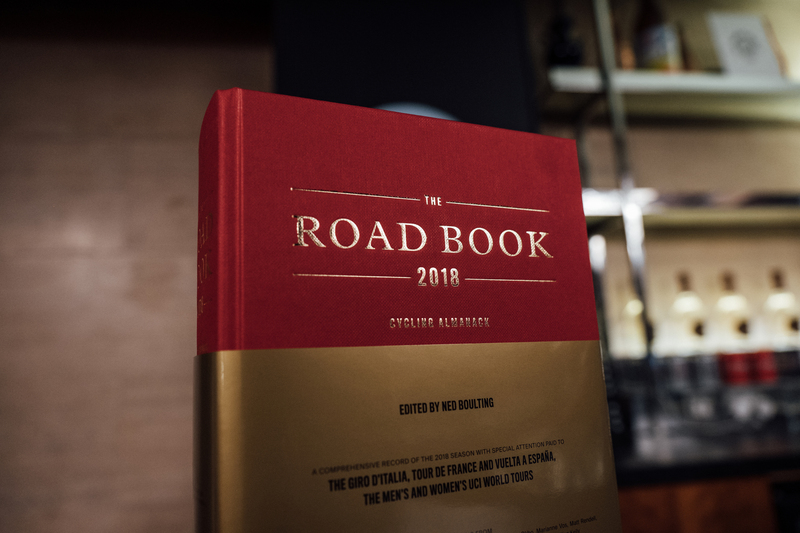 Carlton, Jim and Donna chat with Ned Boulting about The Road Book. After the break we hear from Dr. Ian Walker and his latest helmet research. Video of Ned discussing the book. Tough at bike retail – ASE collapse, and the equivalent in the UK, Evans Cycles. Dr Ian Walker interviewed in The Psychologist magazine. Motorists Punish Helmet-Wearing Cyclists With Close Passes, Confirms Data Recrunch. 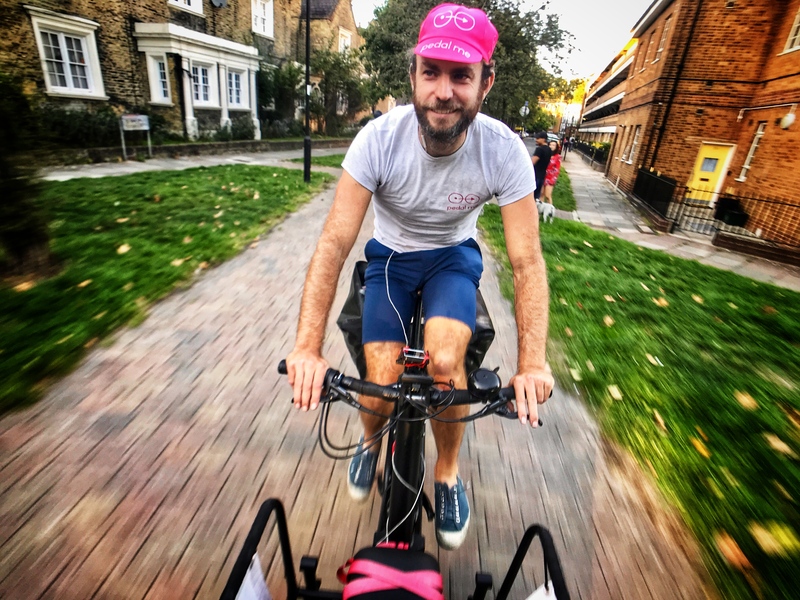 Today’s episode features a rolling interview with Benjamin Knowles of Pedal Me, a new Uber-style cycle-courier/taxi-service in London. There’s some loud traffic noise in the first half of the interview and then all goes calm as we descend into Pedal Me’s underground lair where we discuss crowdfunding – the company is seeking £150,000 from micro investors on Crowdcube. That campaign goes lives soon.